Gallimaufry [gal-uh-maw-free] - A hodgepodge; jumble; confused medley. One of the things I like about this project is the fact that it's unique, at least I think it is. So far the only people who have seen and know about it are you guys, until my recent card show trip that is. After scoping the place out I settled in at one particular table ready to thumb through thousands of dime and quarter singles. Midway though, I was the only one left at the guy's table and he asked me if I was looking for anything in particular and I told him I really wasn't. Then he looked at some of the cards I had set aside and asked me why I chose them, as they're a pretty random mix. I told him about the criteria for the project, photos of mismatched equipment, and he seemed kind of dumbfounded at first, but quickly said, "hey, that's actually a pretty cool idea, I've never heard of that before" or sometning similar. I thought that was pretty cool. Not only did the guy take an interest in what I was looking for, but we ended up talking for a good half hour while I continued to thumb through monster box after monster box. I'm not normally one to talk much to dealers, but this guy was alright and it made the buying experience that much better. Okay, I'm sure you've read enough of that by now, let's get to why you really came here, the dime and quarter box "gallimaufry" pickups from the Gibraltar show last weekend. 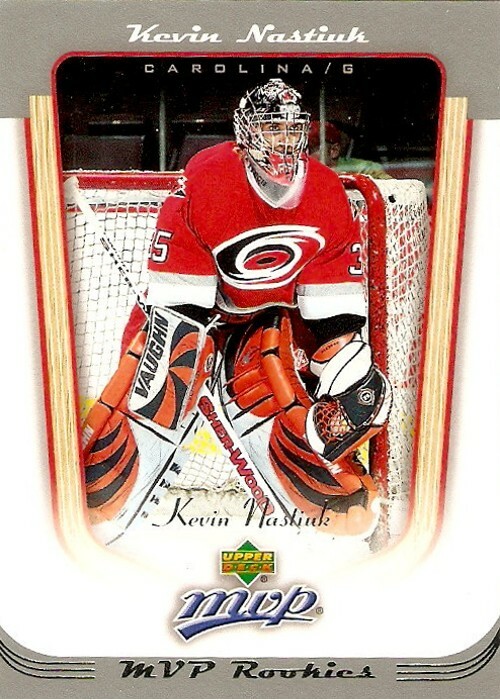 The first one is this Kevin Nastiuk from 2005-06 MVP. As you can see, Nastiuk is pictured with the Hurricanes, but his gear is obviously a mismatch with all the black and orange. That's because he came from the Medicine Hat Tigers of the WHL before suiting up with Carolina after being drafted in the fourth round in 2003. 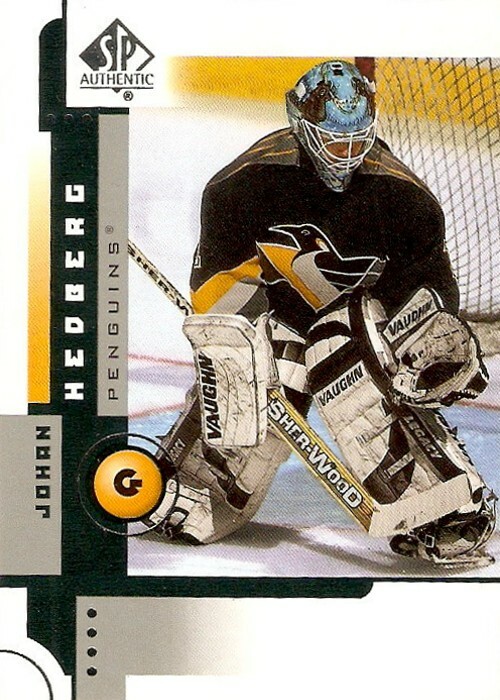 Next we've got one of Johan "Moose" Hedberg from his days with the Penguins. 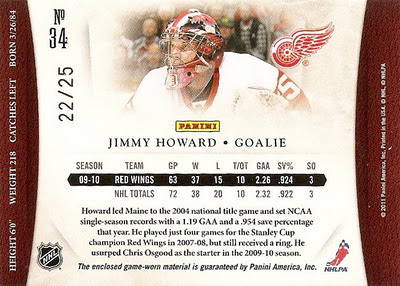 When he burst onto the scene in 2001, he was wearing his blue Manitoba Moose mask, hence the nickname, and it stuck with him for a while, resulting in plenty of cards like this one from 2001-02 Top Shelf. As far as I'm concerned, this one is perfect for the project. 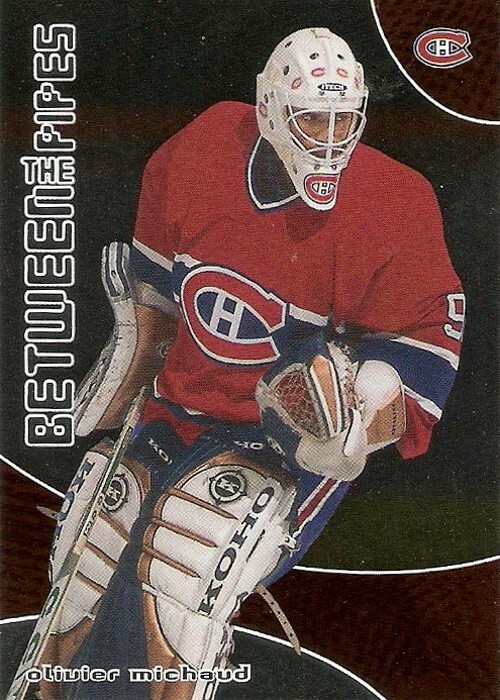 Here's another one of "Moose" with his blue mask, this time from 2001-02 SP Authentic. 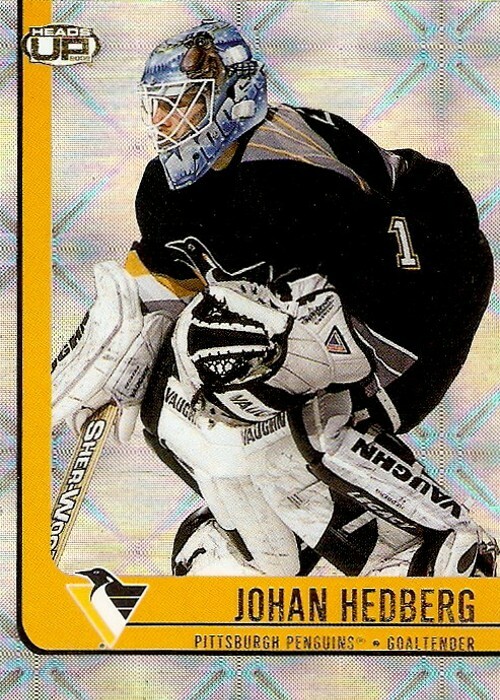 These ones are a bit of an oddity for the set, if there is such a thing, because Hedberg purposely stuck with the mismatched mask if I remember correctly. That is until he debuted the Penguin-colored version of the mask the following season I believe. 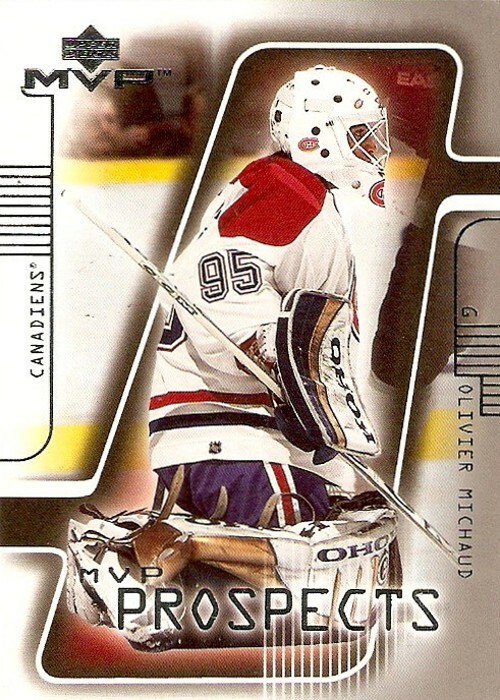 This next on features a goalie that's already part of the collection, Olivier Michaud of the Montreal Canadiens. Check out that post here. This one's not much better or worse than the first one, although it does give a better overall look at his equipment mismatch. It comes from the 2001-02 Topps Young Stars set, which is actually a pretty sharp looking design. Here's another one of Michaud, this time from 2001-02 MVP. Not much different here, only this time you see him in the home white uniform, which if you ask me, makes the equipment mismatch a little less noticeable. 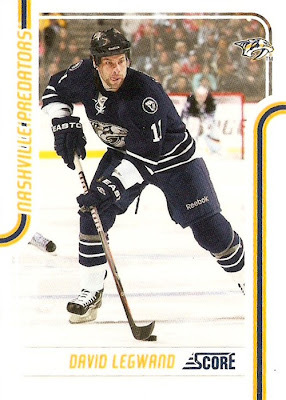 I managed to find one more of Michaud at this table and it's pretty much the same as the MVP one above, although it comes from the 2001-02 Victory Prospects subset. That makes four Olivier Michaud's in the collection, which I think gives him the lead by one. Now for the last of this first group, and I think I saved the best for last. 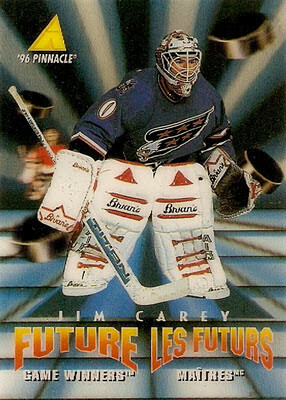 It's a Jim Carey Future Game Winners card from the 1995-96 Pinnacle McDonald's set. As you can Carey is picured with the Capitals, but his equipment was a holdover from the Caps original red, white, and blue look. Doesn't go to well with the blue, black, and copper does it? And is that a tiny Marty Brodeur I see in the background to the left? So there you have it, I actually found a use for some of those unwanted dime and quarter box cards that seem to go completely untouched by most collectors at most shows. Everyone is so caught up with the high-end hullabaloo that they forget about the foundation of this hobby, base cards like these. Whatever, I'll take it and I'll continue to enjoy looking for more cards for this project. I'd say I did pretty good for around $2, wouldn't you? In the spirit of the "What does $25 Getcha" series over at Collecting for Kicks, I thought I would do the same kind of breakdown for my latest card show trip. The show I made the trip out to was the same as the last few I've shared here, which is pretty much the only show I ever go to, at the Gibraltar Trade Center in Taylor, MI. It was your typical three day weekend show with plenty of dealers and all kinds of cards and other memorabilia (i.e. photos, jerseys, action figures, etc) on display. The shows gotten noticeably bigger the past few times I've been there, so that's kind of nice to see. There was a decent crowd today, and I think I'm glad I chose today because Nicklas Lidstrom is the featured signer tomorrow and that could get pretty hectic. 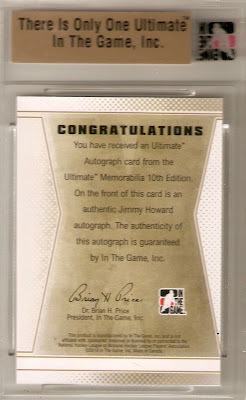 On a side note, I did manage to make a trade with one of the dealers for another nice addition to my Howard collection. That'll also be part of the show and tell from this trip to the show, but not included as part of the $21 I spent there. What better way is there to start a nice four day break from work than with another PC mailday? 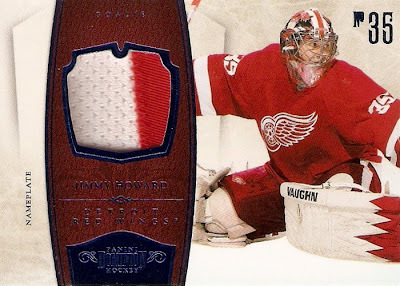 Today's mail brought me another nice piece for my Jimmy Howard collection. 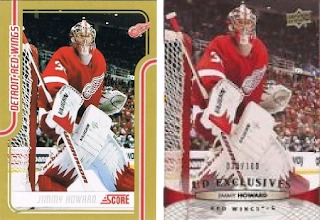 It also brings me one card closer (three out of four) to my first Howard rainbow. The card I'm referring to is a Ruby parallel from 2010-11 Black Diamond numbered 070/100. One thing I will say is that I hate scanning anything from Black Diamond. 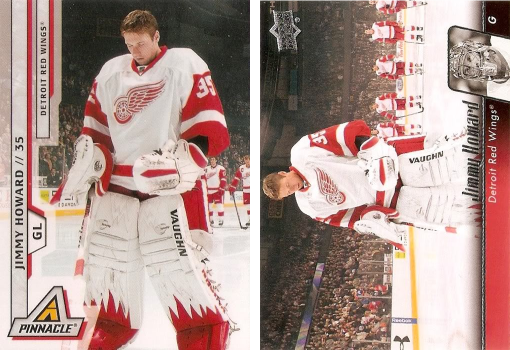 There is just something about the cards from this set, no matter what year it is, that my scanner does not like. I always have to go in and mess with the contrast and brightness just to get something that's halfway decent. Even then it's not that great looking. Now I just need to track down the Gold version numbered to just 10 copies. Easier said than done. I actually found one on eBay a few months back, but ended up missing out on it, so I'm on the lookout again. I think this is one of those things that I won't see that many times, so next time I want to win at any cost, well almost any cost. 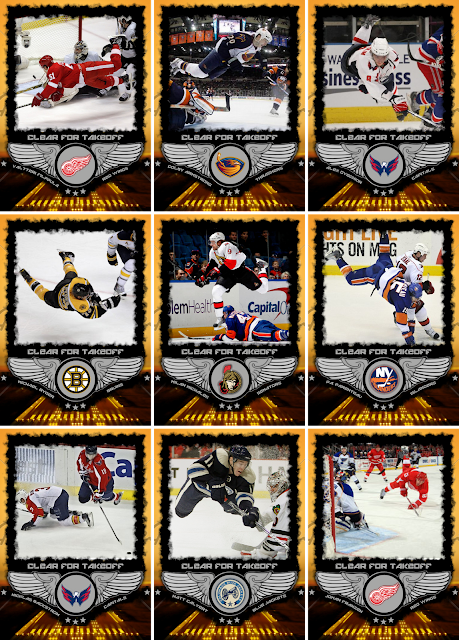 Seeing the latest custom design over at My Hockey Card Obsession, which is pretty impressive I might add, is what motivated me to finish the latest custom set idea I've been working on and finally share it with everyone. This is another one of those ideas that just came out of nowhere and I just started throwing things together and what you see below is the final result of a few different iterations and a few hours work. While this one wasn't the inspiration for the set idea, it ended up being the best picture and my favorite of the bunch. As you can see, these cards deal with pictures in which the players are airborne, whether that means they are scoring, taking a shot, or just avoiding an opponent. Also, if you don't know, the picture above was taken as Filppula beat Marc-Andre Fleury in game two of the 2008 Stanley Cup Finals. As far as the name, Clear for Takeoff, it just kind of popped in my head and I stuck with it. Now I know it's not that original, but sometimes things just work the way they are and I think that's the case here. Or should I have gone with Cleared for Takeoff, oh well, who knows? It is what it is now. 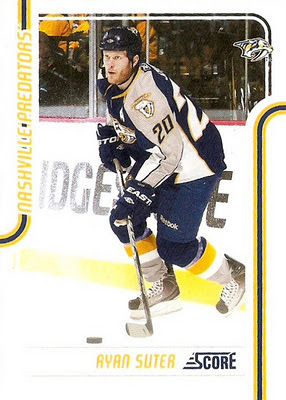 Beyond the Filppula, the Colby Armstrong has to be my next favorite, and that's the one that was actually the inspiration for the entire set. As far as how that goes, well I came across a Puck Daddy article on the top hockey hugs and some of them featured players leaping into the air. Well, at first I thought I would do that for the set, but then I came across the Armstrong pic and changed my mind to what you see here. After a little searching for a generic airport runway/takeoff pic and the clipart pilot's wings, I threw everything together and came up with the basic design you see here. I played around a bit with different fonts, but ended up settling on the one you see, called "Bigmacca" from Dafont.com. I though it went well with the whole airplane theme. The five stars were the last thing I added as I felt the name bar just needed a little something extra, and they fit the bill perfectly. The only other thing I made sure to do was include a nice full color team logo on each card, and the circle in the center of the pilot's wings worked out just right for that. So what do you guys think? I was going for something that was a bit different and I think I accomplished that, wouldn't you say? 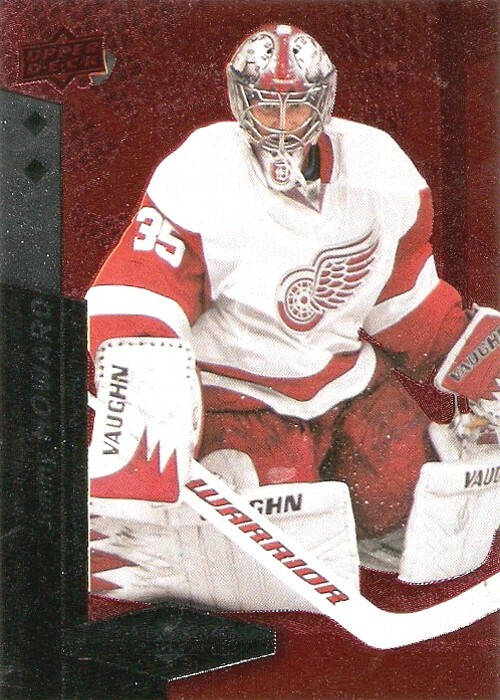 A little while back I wrote a post about some of Jimmy Howard's cards from different manufacturers using the same picture on multiple occasions. 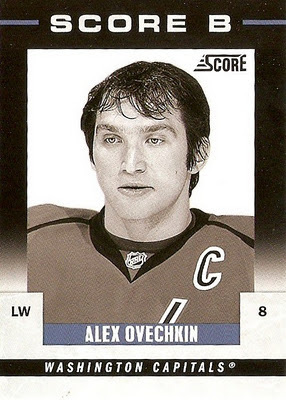 I only brought that up because I like to see a variety when it comes to cards of a single player, and two different cards with the same picture just make things a bit repetitive. Now, for a little background first. I don't know why but for some reason I've become a Nashville Predators fan, unless of course they're playing my Red Wings. I know that sounds weird coming from a Wings fan, but there's just something I like about that team now. 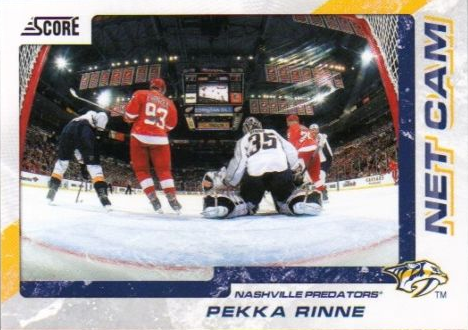 Anyway, because of this I found myself looking for some Pekka Rinne stuff on eBay the other day (maybe the start of another PC...) and came across what I tought was the same exact card twice, at first. However, upon closer inspection I realized there was no incorrect listing or anything like that, just two different cards with the same picture. 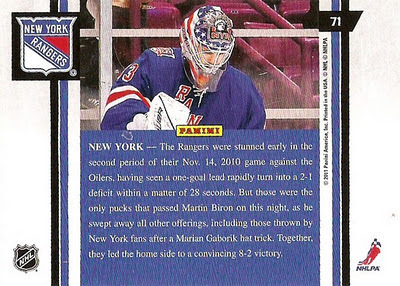 Good work Panini, how pathetic is that? 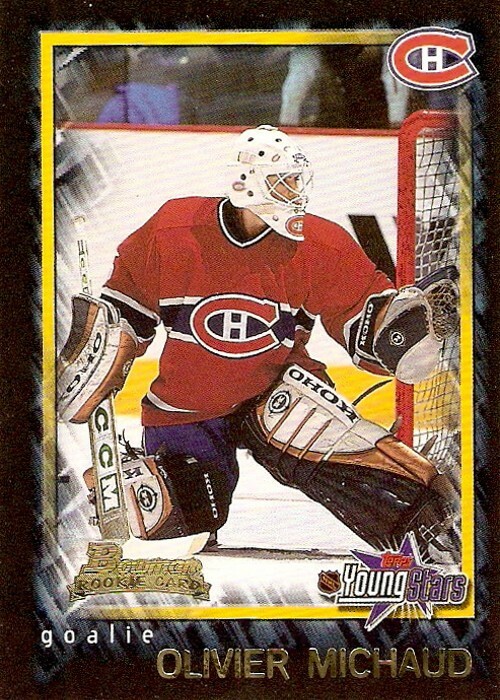 I'd be slightly annoyed if I were actually a Rinne collector. It's forgivable if two companies just happen to use the same picture, but this? I don't know, but it just bugs me for some reason. 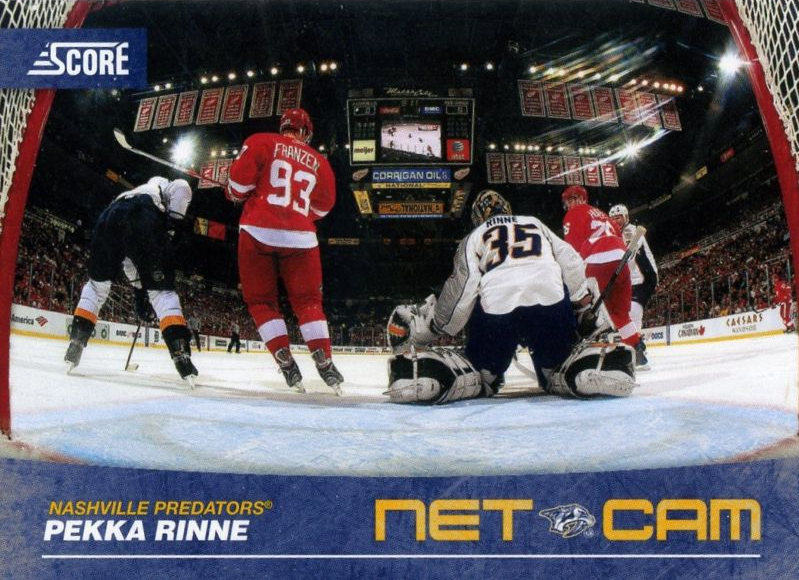 How difficult could it have been to find a new net cam shot of Rinne. There has to be more than one out there from the last year of action, right? What do you guys think? I know I shouldn't let things like this get to me, but for some reason I can't let it go. Well, it looks like I've got another first for my Howard collection. This time, as you probably deduced from the title, I've ventured into Ultimate Memorabilia territory for the first time. More specifically, I've made my first addition from the 10th edition of the product, from 2010-11, in the form of an Ultimate Autograph numbered to just 24 copies. Normally I look at box/pack breaks of this stuff on the forums and don't care for a lot of the designs, but this one is different. I like it. I really like the nice closeup showing Jimmy's mask as well as the simple, non-obnoxious color scheme and overall layout of the card. I also like how they worked in the giant "X" behind the player number and team text, to coincide with this being the 10th edition. Now, I've got two minor issues with this card. 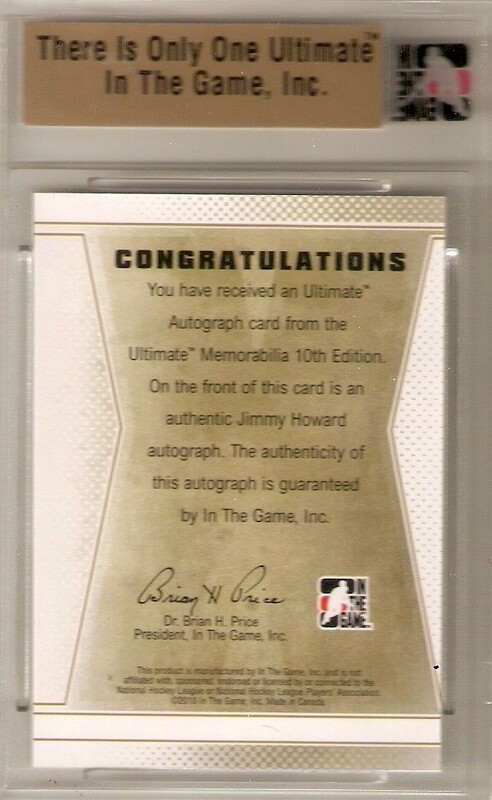 First, it seems as though Jimmy's signature is interrupted by the edge of the cutout window. You'd think they could bring the edges of the sticker and the cutout window a bit closer together. I would understand if the auto went outside the edge of the sticker to begin with, but here that doesn't seem to be the case. 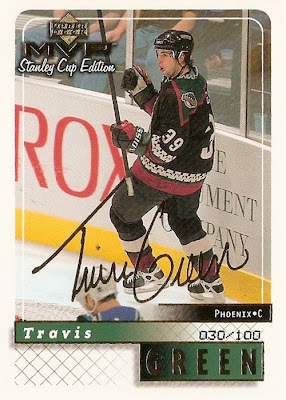 On a side note, it's kind of funny that the auto has his number 33 from Grand Rapids, rather then the 35 that's printed on the card and part of the picture on the card, as he's always worn 35 with the Wings. 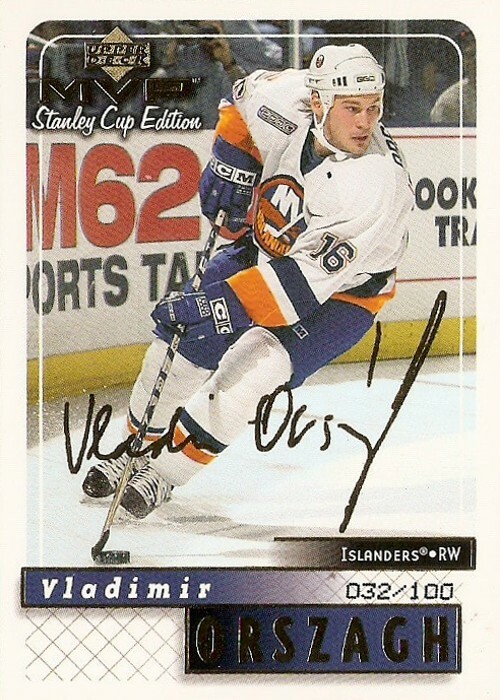 Other than that, I'm thrilled to have this card in my collection, as it still is an auto numbered less than 25. Oh, almost forgot to mention this, but I ended up getting it for just $14 on the bay. Is that a good deal, or what? If not, let me know because I don't really have a sense for what these things usually sell for. Finally. a question for you ITG collectors out there: how do you store these slabbed cards? This thing is a bit wider than the one-touches and top-loaders I store in my standard monster boxes, so I don't really know what to do with it. Are there boxes with wider slots out there to accommodate these things? There was one other good thing to come out of my three pack break of 2011-12 Score and that was another candidate for my "Goaltending Gallimaufry" project. 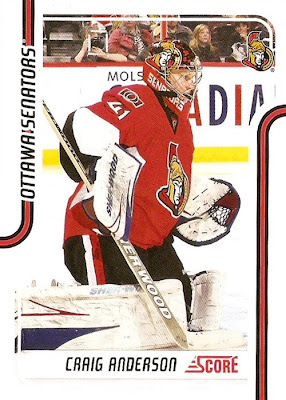 It was this Craig Anderson, featuring him wearing the remnants of his Colorado gear after being dealt to the Senators back in February. As you can see, this photo was taken sometime after Anderson switched to his Senators themed mask, but before he made the full transition to Ottawa colors. Either way, this one still meets the criteria for the project and is a welcome addition for the new season. If anything, this card gives me at least somewhat of a reason to keep busting packs, as I never know when I'm going to come arcross one of these. That's the nice part about this project, as it covers just about any base set out there. That's it for now. Since I wasn't able to make it up to Toronto for the expo recently, I'm hoping to hit up one of the local shows with my upcoming vacation time, but we'll see. This time of year is busy enough, so trying to squeeze it in will be interesting. I made a trip to the LCS the other day to pick up some top loaders and one-touches for my recent Howard pickups, but they were out of the 180 pt so I grabbed some 75 pt top loaders and a few packs of 2011-12 Score with the cash I had in hand. This was the same LCS I found a few weeks back, Stadium Cards and Comics. The cool thing was that this store is where the 1978-79 Montreal Canadiens mini Stanley Cup redemption was pulled. Click here to read about it over at The Knight's Lance. 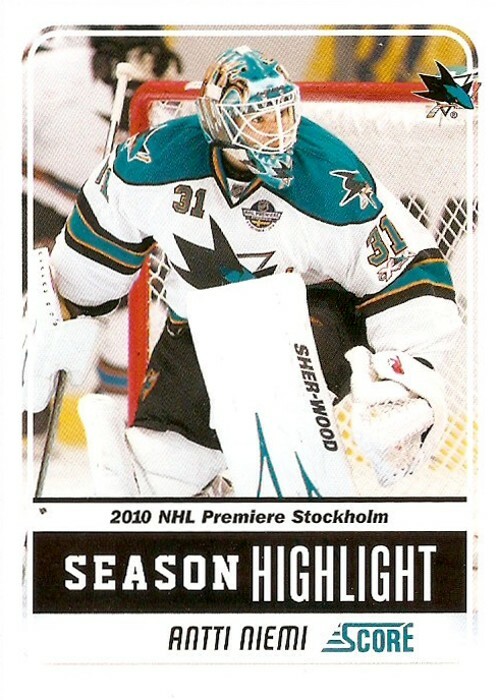 This next one is one of the "Season Highlight" cards, featuring Antti Niemi of the San Jose Sharks. This one is kind of neat because the photo actually matches the moment on the card and features Niemi in his very first game as a Shark. As far as rookie cards go, Score brought back the Hot Rookies again with a design pretty similar to last year. Of course I ended up getting two no-namers again, and here's one of them. 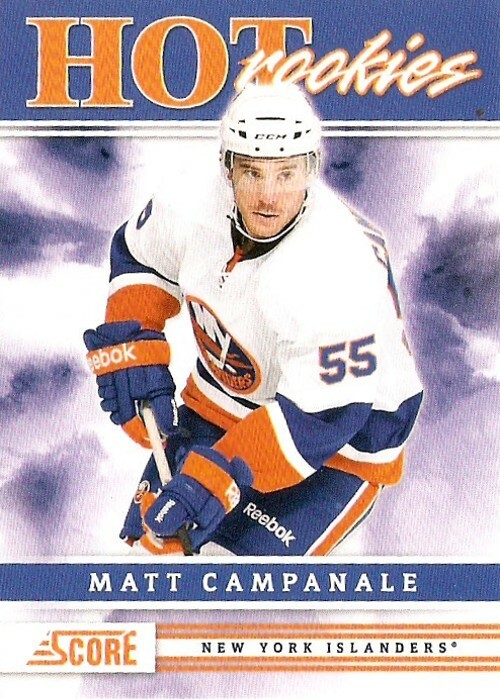 Who else has heard of Matt Campanale before? Finally a decent insert, well at least I think it's decent. I don't know, you tell me. It's an Alex Ovechkin card from the Score B set. These are actually pretty cool and rank up there with the Net Cams as my favorite Score inserts. Let's just say this is another reminder of why I tend not to buy single packs, hoping to get something good out of them (i.e. something for my PC or something of great trade value). At this point, I'd rather put the money towards singles for my PC, but there's always something about busting packs/boxes that brings me back for more time and time again. All is up for trade if anyone's interested. I'd be looking for the usual stuff in return (i.e. Howard, MVP, etc). Like I said in my last "Goaltending Gallimaufry" post, good things come in three's. This time however, as you can probably tell by the title, it's all about my MVP Gold Script collection. These next three make up another trio I purchased on eBay in the last week or so. So, not really any huge names there, but that's part of the fun that comes with building a set like this. The best part is these are the ones that come at a great price, I'm not really looking forward to tracking down some of the bigger names (i.e. Yzerman, Roy, Messier, etc.) as they're going to get pricey. Anyway, these three bring the Gold Script total to 34 out of 220, that's just about 15.5% of the entire set. I'll just have to hope I can keep picking them up in small lots like this, as it helps save on shipping quite a bit. These three set me back about $3 and the shipping was only $2. Not bad if you ask me. Sometimes there are things in this hobby that I believe are okay to complain about, and these are things like receiving damaged cards among others, but specifically for this post, I'm thinking of pictures being reused. In this day and age, is it really that difficult for card companies to use different photographers when putting together card designs? Let me preface my latest findings with something from the 2010-11 season. In that case, UD Series II and Pinnacle made use of the exact same picture of Jimmy Howard. Not sure which came out first, but I still find it kind of annoying as a player collector that I've got two different (well, more like 12 different with all the parallels between both sets) cards with the same picture on them. Take a look. Now, as far as 2011-12 goes, here's what I just noticed on eBay just today during one of my daily searches (sorry for the awful quality on the UD scan). On the left you have a Gold parallel from Score and on the right an Exclusives parallel from UD Series I. Those look like the exact same picture to me, wouldn't you agree? Am I way off base here? Any of you player collectors out there probably understand, so I'd like to get your thoughts on this. Am I in the right to be a little annoyed here, or should I just chalk it up to dumb luck that the pictures are the same and not worry about it? Good things come in three's, or at least that's how the saying goes. Today, since I've yet to receive the two packages I'm waiting on from eBay, it's three more additions to my gallimaufry project. These three are again from the stack I came up with when searching through my binders and monster boxes. I'm sharing them in three's because I would like to keep the length of these posts manageable. That said, here is the first of the three, a Chris Terreri from 1995-96 Fleer Ultra Extra. 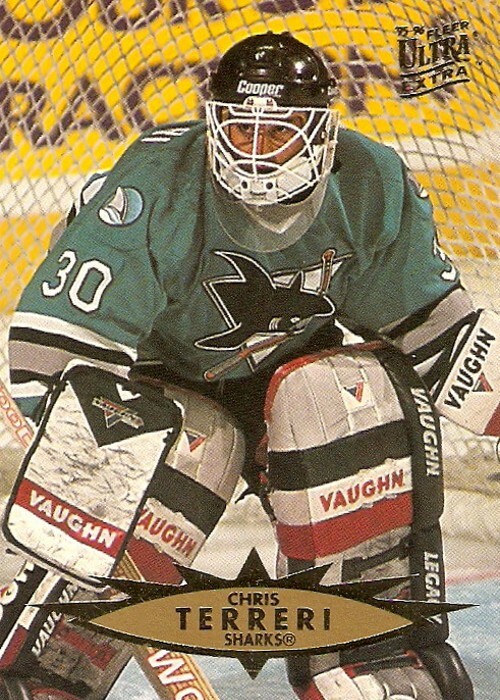 In the photo you can see he's still wearing his gear from his time with New Jersey, where he spent only four games in 1995-96 before being traded to the Sharks. As a plus, it seems as though his Osgood-style mask didn't have to change. 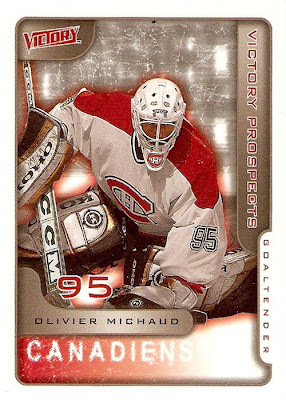 Next we've got Olivier Michaud of the Montreal Canadiens featured on the front of a card from the 2001-02 Between The Pipes set. It looks as though he came from Edmonton, except for the sticker job on the mask, but he in fact came straight out of Shawinigan in the QMJHL for just a single game with the Habs back in 2001-02. So, I'm guessing that's where the Oiler-ish equipment comes from, but I could be wrong. 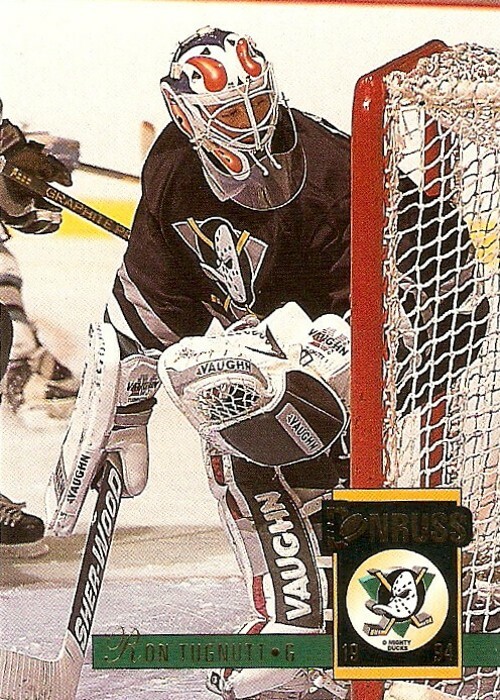 Here's another older one for you, a Ron Tugnutt from 1993-94 Donruss featuring him with the Mighty Ducks. 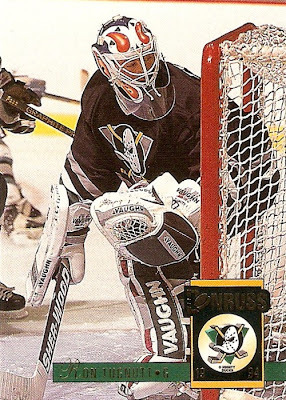 That's significant because he only played there for 28 games, which I guess was not enough time for him to get new gear after being claimed by the Mighty Ducks in the 1993 Expansion Draft. Although, you would think being picked up during the off-season would allow time for that. I guess not. That's all for now. These three bring the gallimaufry total to 31. This project is also proving to be a lot of fun as it's something different and it's neat to see all of them together in the binder. It may not be the prettiest looking set of pages, but it's definitely something to look at. Now, I'm hoping I'll be able to make it to a show here soon to see if I can find anything in the dime and quarter boxes, but we'll see. Well, just got done with another roller hockey game in our fall season. It was a pretty boring game, but we ended up getting the win 14-6, in which I managed six goals and two assists. I say boring because the other team's goalie didn't show up, so we were shooting on a defenseman the whole game. Don't you just hate when that kind of stuff happens? Anyway onto today's post. By the way, I can't believe I've already done 80 of these so far, the first one just seems like forever ago now. 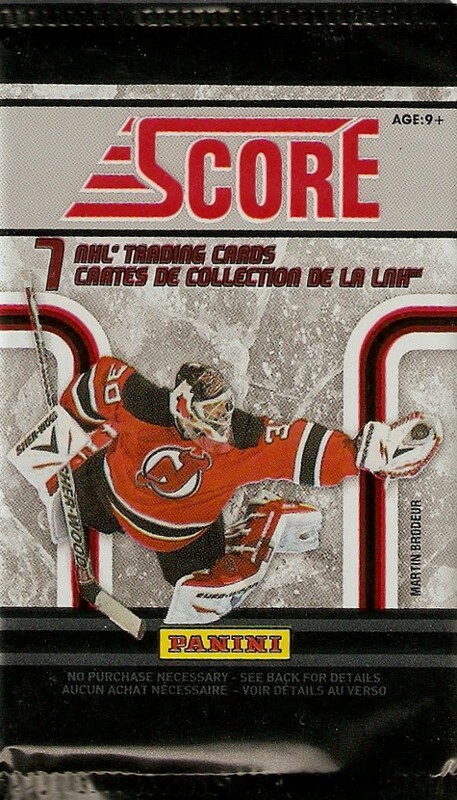 This one is another pick that focuses on a base card with a pretty cool picture on the front. 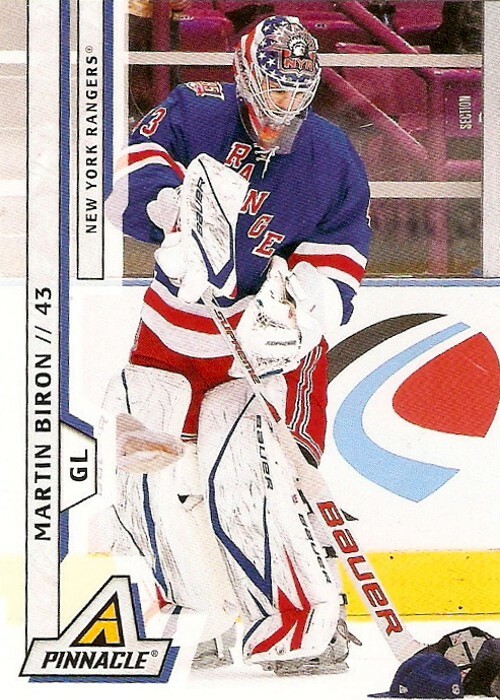 Its a Martin Biron, from 2010-11 Pinnacle, which has quite a few interesting pictures, that shows him shoveling some hats around the MSG ice, presumably after a hat trick by one of his teammates. Now that's something you don't see everyday on the front of a card, is it? As far as finding out who score the hat trick, look no further than the back of the card, as each one in the Pinnacle base set has a short description where and when the photo was taken. This is probably the only time you would have to have the same picture on front and back, just to avoid confusion with the description, wouldn't you agree? I can honestly say this is the first time that I've been able to post a video for one of these things that doesn't involve the player actually pictured on the front of the card. There were a couple of nice goals there too, nothing better than being in alone on the goalie like that, as long as you bury it like Gaborik did of course. Well, this post is a little less satisfying to write because of the eventual outcome of the game, but I had a pretty good time down at the old Joe Louis Arena the other night when the Wings hosted the Minnesota Wild. I ended up getting the four seats my company has so a friend from the office and I each brought our significant other along. The seats were in the 10th row of section 207, right about on the red line. First, here's a look at the ticket. 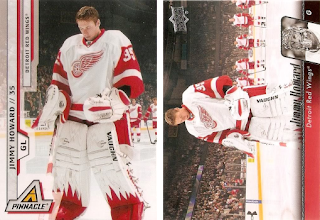 The Wings usually have some kind of design to these things and they often feature one or more of the players, in this case Drew Miller. $65 face value is a bit much for regular season hockey if you ask me, but I guess people are willing to pay it. I don't remember which period it was, obviously the first or the third, but this picture shows the aftermath of Harding getting drilled by a Red Wing behind the net, from which he hit the ice like a sack of potatoes. It was kind of funny because after he laid there for a couple of minutes everyone started to boo him. With this being a Wings game and all, I got to see my man Jimmy Howard play again. This picture is just another one I got during a break in the action. He played a great game and kept it from being a 3-1 Minnesota lead or something like that for most of the game. This last one was taken during the third period with the Wild attacking to my right. I don't know when this was taken during the period or what happened on the play, but it's a nice shot of the action. Just for kicks, here's the highlight video for the game. Too bad they didn't put Harding getting drilled in there, oh well. They did however, show the Wings getting royally screwed on a goaltender interference call as the Wild scored in overtime. All in all, even though the Wings lost and kind of got screwed in the process, it was still a great night out in the city of Detroit. Yes, that is possible. Guess how much this one set me back? Keep in mind it's from Dominion, it's numbered 22/25, it's a nice two-color split, and I'm a Howard collector so I didn't want to let it get away. I'll let you think about that for a minute before I tell you. Anyway, the first thing I noticed about this card when it came out of the bubble mailer is how massively thick it is compared to anything else in my collection, except for maybe my Hot Prospects auto patch. It's just got a higher-end kind of feel to it, although the design is definitely not as sharp as The Cup, but UD decided to exclude Mr. Howard from that set. On the back of the card you can see the serial number 22/25, so no eBay 1/1 here (i.e. 1/25 or 25/25). One thing I did really like about this card is that it uses a different picture than on the front, something that seems to have been lost with most releases lately. The only thing I would change about the back is the way the card number is written. 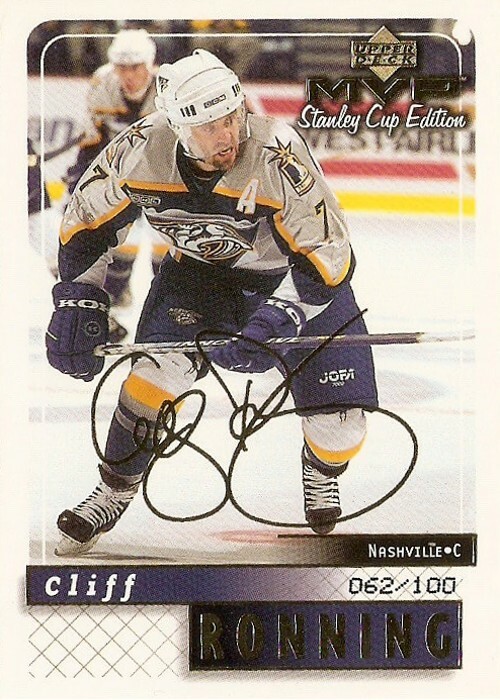 It could be confused with the player number, which is written the same way with the "No" as on the front. 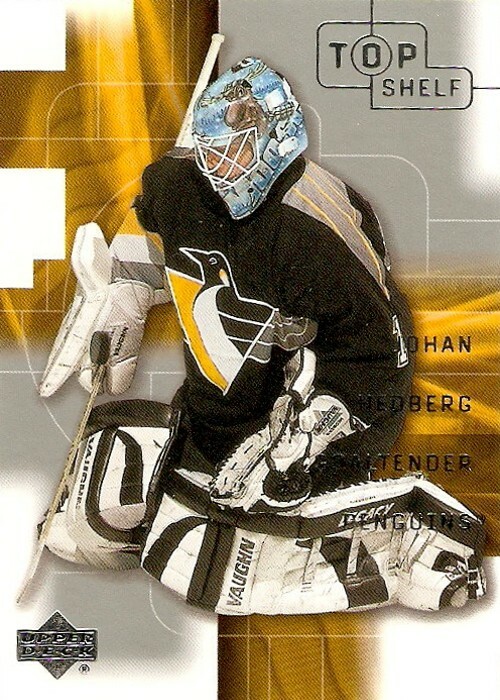 Other than that, it's a pretty solid card back design. Oh, almost forgot. I only ended up paying $4.29 for this one. I thought that was a steal, but after sharing it on SCF and getting some member feedback, I'm realizing Dominion is just kind of "cheap" and this isn't what everyone would call a steal. Oh well, I'm not everyone, and what I think is all that matters when it comes to my collection, right? 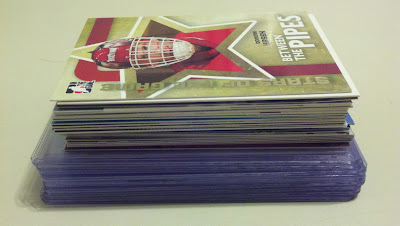 With this hockey card blog I want to share my personal collection as well as track any new additions. I would also like to share my custom card designs and my thoughts about this great hobby. Alex Delvecchio: The NHL’s True Ironman?